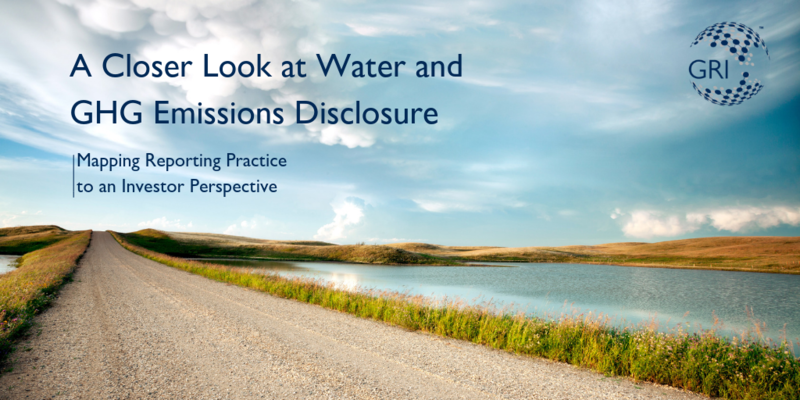 AMSTERDAM, February 8, 2019 /3BL Media/ - GRI is launching the discussion paper A Closer Look at Water and GHG Emissions Disclosure, which contains key findings on corporate reporting on water and greenhouse gas (GHG) emissions. This publication, which was made possible with financial support from the Alcoa Foundation, encourages active dialogue between data producers (report issuers) and data users (investors and data service providers). Investors that integrate ESG issues into their investment decisions consider climate change a priority, and water and greenhouse gas emissions are crucial to aid in this task. The publication combines the thoughts of experienced asset managers from around the world on the current state of corporate reporting on water and GHG emissions, and an analysis of GRI reports. “While sustainable investing is on the rise, we need to use this momentum to speed up efforts. We hope this paper, which looks at water and GHG emissions, jumpstarts the discussion on how to further align corporate reporting with investor expectations, and encourage companies and asset managers to find common ground for meaningful disclosure.” says Eszter Vitorino, Head of Capital Markets Engagement at GRI. The discussion paper builds on the recent release of In-focus: Addressing Investor needs in Business Reporting on the SDGs, which is part of the Reporting on the SDGs Action Platform. It also complements previous collaboration between the Alcoa Foundation, GRI, and RobecoSAM, Defining Materiality: What Matters to Reporters and Investors (2015) and Defining What Matters: Do companies and investors agree on what is material? (2016) which sought to assess whether sustainability report issuers and investors identify the same topics as material. GRI is an independent international organization that has pioneered sustainability reporting since 1997. GRI helps businesses and governments worldwide understand and communicate their impact on critical sustainability issues such as climate change, human rights, governance and social well-being. This enables real action to create social, environmental and economic benefits for everyone. The GRI Sustainability Reporting Standards are developed with true multi-stakeholder contributions and rooted in the public interest. The GRI Standards are the first global standards for sustainability reporting. They feature a modular, interrelated structure, and represent the global best practice for reporting on a range of economic, environmental and social impacts.